I woke up this rainy morning to find a couple snails in our front yard. One was on the sidewalk leading up to our front door while the other was starting to crawl up a white lawn chair on our porch. Here in Toronto, it’s not so uncommon to see snails – I don’t really remember seeing any in Calgary though. Apparently, the fastest speed a garden snail can travel is 0.048km/h though, (according to my quick Google search) which seems a little fast to me. It means in the 47 seconds between the two photos, the snail could have travelled a whopping 63cm (627mm). That doesn’t seem right. What do you think? 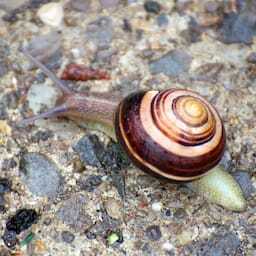 Super Fast Garden Snails was published on Monday, May 2, 2011 at 1:35pm EDT by Daniel Menjívar and last updated on April 11, 2018 at 9:30pm UTC .